Our award winning buildings embody the school’s ethos. Designed by international architects Arup Associates, the buildings combine the best of traditional Ladakhi architecture with 21st century engineering excellence and so act as a model for appropriate, cost effective and sustainable development. Ladakh is an area of few resources and extreme temperatures. Here are the highlights of Arup's design solutions to an extremely challenging design brief. 2001 – The Nursery and Infant courtyard opened. 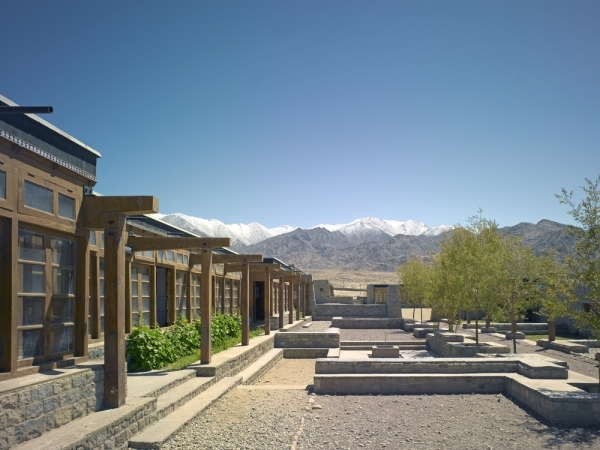 2003 – First residence opened, allowing the school to accommodate children from remote areas. 2005 – The Junior School opened. 2007 – Construction of Science Laboratories and Art room started. 2008/9 – Construction of Residence 3. 2010 – A devastating mudslide swept through the school, the granite buildings stood firm, unlike local mud-brick buildings that were swept away. 2011 – Construction started on a three-metre-high, 1 kilometer-long mudslide defence wall & embankment. 2012/13 – Construction of Residence 4. 2014 – Final two secondary school classrooms were completed. 2015 – Dining Hall & Kitchen extension started. 2017 onwards – Four-year mudslide repair and seismic upgrade programme; four shower blocks; additional mudslide defences; additional latrines; health centre; multi-purpose hall; new visitor centre complex; "10+2" classroom facilities for students aged 16-18; central library. Donations and investments can be made online or sending a cheque to the UK project office. You can find out more on our Donate page.